Repel pigeons with a vinyl inflatable predator that frightens bird pests away! 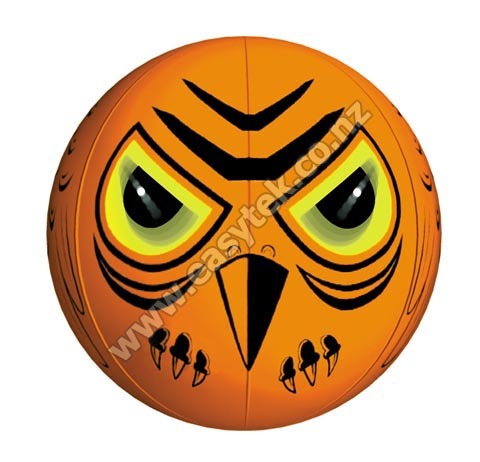 Huge 2-foot hanging ball has menacing, moving eyes on front and back that strike fear in birds! Lenticular eyes produce holographic effects, constantly moving and changing as if they are "following" infesting birds. Made of brilliantly colored heavy duty vinyl; scientifically designed from extensive experience and research on predator and bird behavior. 3-D eyes move forward and sideways following bird pests as they fly away. Hanging spring and air currents do the rest... a totally realistic and scary visual deterrent! TOUGH. Made of heavy duty vinyl. HUGE. Terror Eyes comes as a 2-foot hanging ball. COLORFUL. Brilliantly colored eyes with holographic effects that are constantly moving and changing. TERROR-EYES WORKS AS A VERY EFFECTIVE PIGEON CONTROL DEVICE IN COMBINATION WITH SONIC, ULTRASONIC AND ELECTRONIC BIRD CONTROL REPELLERS! Used where there is a pigeon problem or other bird infestation. Terror Eyes is perfect for Parking Lots, Airports, Highway & Bridge Underpasses, Building Roofs, Marinas, Gardens, Homes, Feed Lots & Farm Fields, Orchards & Vineyards and more. 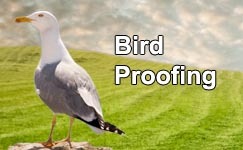 Please note: All bird control solutions prove more effective when different methods are used in combination. EasyTek offers the widest selection of environmentally-friendly, non-lethal bird proofing and animal control solutions in New Zealand. We cater to most bird pest situations and offer our clients tailor-made bird control and bird proofing solutions with guaranteed results. Please contact us to describe your bird pest situation and let one of our professionals suggest effective solutions for you. Terror Eyes reviewed by Jeremy C., Wanganui on 2017-01-04 .